Summer in the Washington area can get unbearably hot. 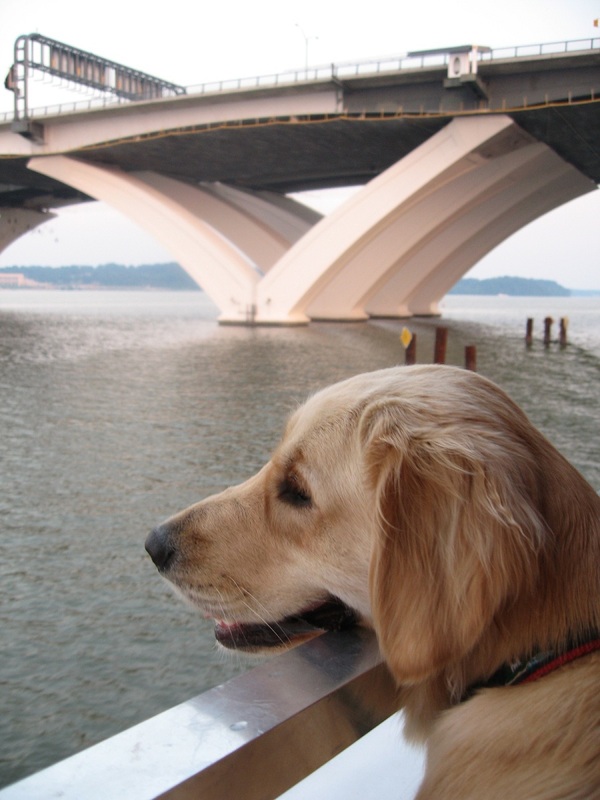 But you have to get out and exercise your pup’s body and mind, so Barkley Square is offering Canine Cruises this summer so you can get out and catch a cool breeze—and great views—on the Potomac. Every Thursday at 7:00 p.m., starting June 14, join Barkley Square and the Potomac Riverboat Company for a 40-minute scenic cruise around Alexandria’s seaport. Tickets are $15 for adults, $9 for children ages 2 to 11, and dogs are FREE. I took Chatham on one of these cruises a few years ago on a fundraiser for Golden Retriever Rescue, Education and Training (GRREAT). It was a blast riding with a boatload of dogs, some who were completely into checking out the views, like Chatham, and others who laid at their owner’s feet and could care less that they were on a boat. I highly recommend making a night of it in dog-friendly Old Town Alexandria, and grabbing a cocktail and bite to eat first at the Yappy Hour at Hotel Monaco just a few blocks up King St., which is held every Tuesday and Thursday all summer and starts at 5:00 p.m. Dogs must be on a flat (non-flex) leash no more than 6 feet long. Advance purchase is recommended. Canine cruises will run every Thursday through Sept. 13. The boat departs from the dock behind the Topedo Arts Factory at Cameron and Union Streets. we r going here 2day and my pups gonna luv it according to this!